Julia’s Review: Lucky Strike | What is ML Reading? Favorite person: Chum because he was nice to everybody. I sort of pitied him because he was just looking for a friend, but no one wanted to be his friend until Nate and Gen came along. Favorite part: When Ruth and Rebecca found the turtle nest. Synopsis from Arthur Levine Books “Nate Harlow would love to be lucky, just once! He’d like to win a prize, get picked first, call a coin toss right, even! But his best friend, Genesis Beam (aka Gen), believes in science and logic, and she doesn’t think for one second that there’s such a thing as luck, good or bad. She doesn’t care what names the other kids call them. She cares about being right, about saving the turtles of Paradise Beach, and she cares about Nate. Then, on his birthday, at the Goofy Golf mini-golf course, Nate is struck by lightning — and survives! Suddenly baseballs are drawn to his bat-popular kids want HIM on their side. It seems the whole town of Paradise Beach thinks Nate has the magic touch. 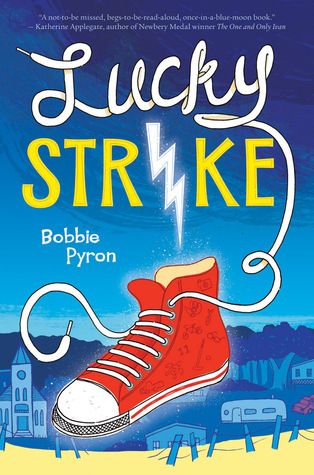 This entry was posted in Julia's Reviews, Middle Grade Fiction and tagged Bobbie Pryon, Julia's Reviews, Lucky Strike by mlreads. Bookmark the permalink.